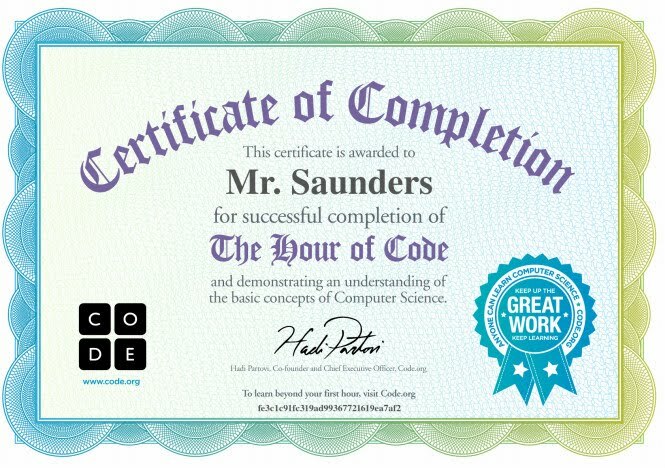 The Hour of Code is a site designed to provide every student an opportunity to try computer science for one hour. It was launched last week during Computer Science Education Week (Dec. 9-15), but will be available all year long. This might be a good site to check out if you are looking for critical thinking & problem solving activities to do with your class the week before Winter break. Your class can participate in the hour of code by going to code.org and clicking on the start button. There are a few video segments intertwined throughout the self guided sessions so you may want to encourage your students to wear headphones when working on this activity. Here is a brief video explaining the main concept behind the development of this site. Hour of Code - Introduction from HCPS Instructional Technology on Vimeo. Once a student completes the hour long course they will receive a fancy Certificate of Completion, and be provided with links to more in-depth information about coding.